So which smartphones have the best battery life? Thanks to its massive 3300mAh battery, the Motorola DROID RAZR MAXX scored the best battery life among smartphones in a test conducted by GSM Arena. The site measured the battery life of a number of handsets in three different categories: Web Browsing, Video Playback and Talk Time. So how did some of your favorite handsets make out in the test? 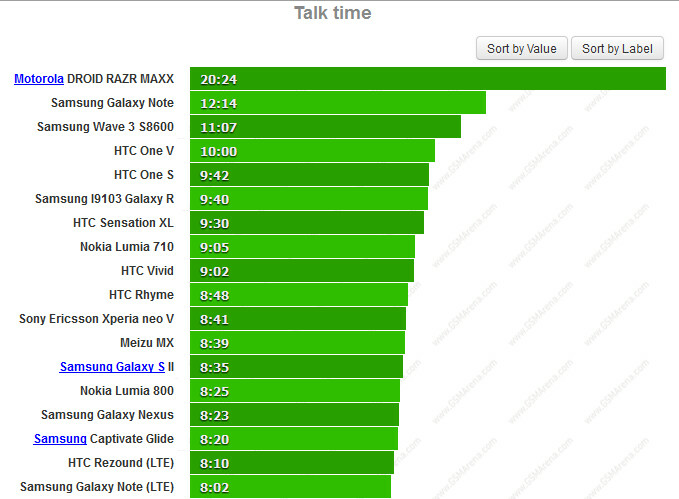 In Talk Time, the top ranked Motorola DROID RAZR MAXX lasted 20 hours and 24 minutes, surpassing the 12 hour hours and 14 minutes that you could chat non-stop using the overseas edition of the Samsung GALAXY Note. The LTE variant of the phablet lasted a much shorter 8 hours and 2 minutes. In case you were wondering (and we know you were), the Samsung Galaxy S II came in at 8 hours and 25 minutes while the Apple iPhone 4S lasted for 7 hours and 41 minutes. When it came to web browsing, the Motorola DROID RAZR MAXX let the testers surf for 7 hours and 23 minutes before conking out. The HTC Radar was second and lasted 7 hours and 17 seconds. Lasting for 6 hours and 56 seconds, the Apple iPhone 4S was third. 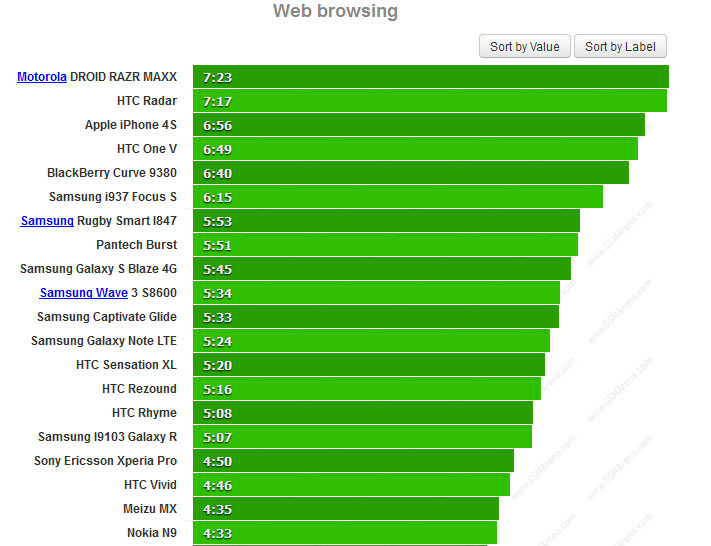 The Samsung Galaxy S II was further down the list with a score of 4 hours. Strangely enough, the LTE version of the Samsung GALAXY Note out lasted the overseas variant of the phone when it came to browsing the web. The 4G LTE model let you go online for 5 hours and 24 minutes before shutting down compared to the paltry 3 hours and 35 minutes on the international model. The last category, video playback, also belonged to the Motorola DROID RAZR MAXX which let you watch 14 hours and 17 minutes of video, or 28 episodes of Two and a Half Men, before the battery died. The Samsung Rugby Smart finished second with a score of 9 hours and 34 minutes. The Apple iPhone 4S was fourth, but just 10 minutes off the second place score. The Samsung Galaxy S II lasted for 8 hours. 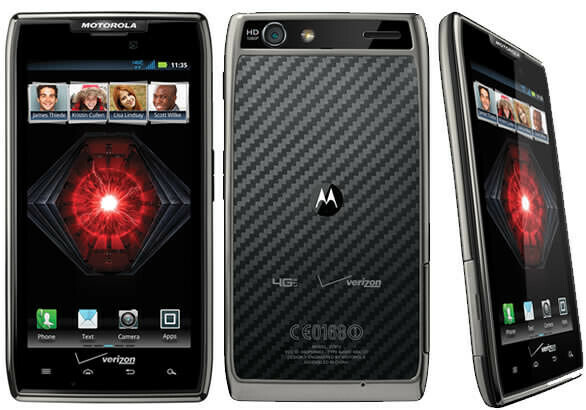 Has Motorola made a statement with the 3300mAh cell it put in the DROID RAZR MAXX? Will we see the manufacturer try to squeeze the same cell into another model? Battery life on smartphones was like the weather, everyone complained about it but no one was willing to do anything about it. Now, consumers have the choice of buying a phone that can last all day without a charge and the success of the Motorola DROID RAZR MAXX could lead others to copy Motorola. Well it's that much more impressive for the maxx considering it uses lte and the iphone is on 3g. I'm curious how the iphone will stack up if it finally gets lte this fall. Biases by pa? You do realize this article was taken from gsmarena? Probably not. gsm arena is the site behinde these test. if I recall corectly, for webbrowsing test, they used wifi and set the brightness to 50 percent, exept for sony xperia S that didnt have any setting for brightness. http://www.youtube.com/watch?v=vLriPNJgotA Starting from Warsaw, through London, Suez, Mumbai, Singapore, Hong Kong, Yokohama, San Francisco, New York and London again, come back and prove that Nokia E6 has a reliable battery that allows you to travel around the world without recharging. Company Overview Created by JWT Warsaw for Nokia Poland, Patron of the project: The Polish Jules Verne Society, Partner of the project: Flower Travel sp. z o.o. Description Welcome to our trip around the world. On the 140th anniversary of the world famous "Around the World in 80 Days" journey, Nokia E6 faced the challenge of Jules Verne. Except for one thing. Instead of 80 days we have 1 battery and no charger. General Information Thanks to an inspiration of a Julius Verne's fan we have one of a kind chance to show to the world all those beautiful cities which Phileas Fogg has seen during his travel. We will document them via posts, photos, movies and recorded phone talks. Join us on Facebook, Foursquare and Youtube. Become a witness of this great adventure. Watch the video first, then judge for yourselves. E6's battery is rated for 15 hours talk time on 2g and about 7hrs 30 minutes on 3g. Very well, watched the video and judged it. In my opinion this is marketing brain rot that proves nothing and wasted two minutes of my time. First of all, why travel around the world? Wouldn't saying at home off charger for the same period of time suffice? Of that one week, how many hours was the phone off (e.g. in flight on the plane)? Also, I couldn't help but notice we don't see him actually using the phone in the video. And apart from a brief segment the majority of the video was shot in populated areas which probably have good coverage (the phone need not work very hard to communicate with the local cell network). not if they make it at least 6mm and add a monster battery like the razr maxx. What the hell are you doing then? Watching P**** movies non stop, having 7 others load in the backgriund and the display at full brightness? 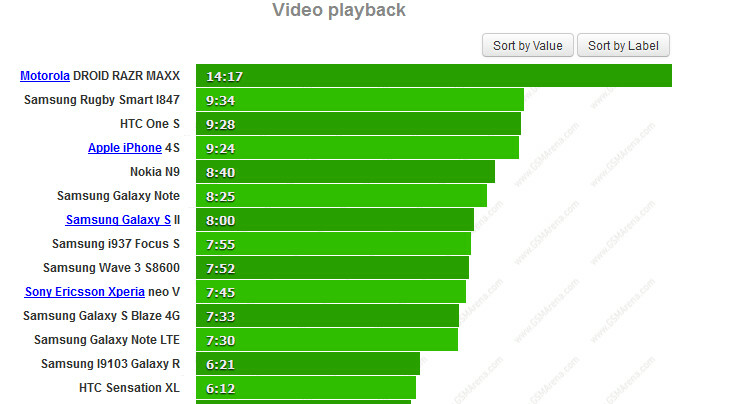 Did you guys noticed that the iPhone is on the web and video playback chart but its nowhere to be found on the Talk time chart lol. I guess its true what they say....iPhone's are not meant to be used as a phone. The iPhone 4S is the very next entry after the LTE Galaxy Note, but PA have trimmed the list so that it's not so huge. The 4S is definitely a web and media consumption focussed device. Not with that puny screen it isn't! come on people. PA said that this was a test conducted by GSM arena. They were just reportin the stats. So... you can't handle the truth that a Nokia Symbian smartphone outlasts almost (if not) all of your Android and iOS devices? Distorting Reality much? Watch the video and judge for yourselves. The Maxx is an amazing phone. I just wish it were priced less and I could actually SELL the damn thing. People are shocked if it comes up in discussion and I tell them how long it lasts. 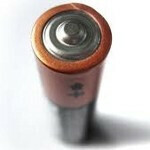 They need to change the name of the topic to "Which Android or Apple phones have the best battery life?" . How can you operate a Phone News Website without including every phone ? "Which Smartphone ?" should include all makes . . . No ? Where is BlackBerry or Nokia Windows ? . . "Oh , we just posted someone else's survey . . . " OK , well you shouldn't post someone else's survey unless it includes Every phonemaker . Apparently it's true when people write to say this Website and News is Android/Apple favored . . . The HTC Radar is a Windows 7 Phone, it is in the Web Browsing paragraph. BlackBerry Curve 9380, Nokia n9, Nokia Lumia 710, Nokia Lumia 800, Nokia Lumia 900, Samsung i937 Focus S, HTC Radar, BlackBerry Bold 9790 are also on the list, if you didn't notice.